1. Nightwish’s "Imaginaerum" film will be done with mostly Canadian actors/actresses. Post-production will take place in Canada and Finland. The names of the actors who have two of the main roles in the film are Marianne Farley and Quinn Lord. Behind the scene photo gallery. 2. Sonata Arctica changed release date of the new DVD "Live in Finland". The DVD will be released November 11th, Europe and November 15, North America. Teaser can be found here. 3. 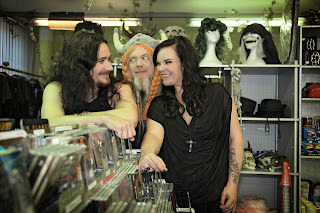 Delain completed the songwriting process for its third studio album, which will be released in the spring 2012. Videos from the studio can be seen here. 4. Opeth released the official music video of their first single "The Devil Orchard" from the new album "Heritage". 5. Evanescence's new song "Made of Stone" with lyrics is now avaible for streaming on their official site.